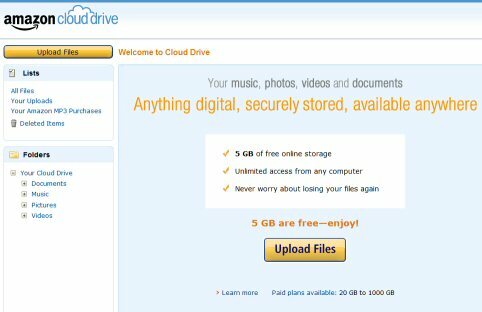 There is a new player in the online backup marketplace and it is Amazon.com: you can now have 5 GB of online storage free of charge, to store files of any kind, including music, videos, pictures, or other types of documents! Encrypt and password-protect external drives with USBCrypt software for Windows 10,8,7, and XP. It’s very easy to start using it: all you need to do is log in to your existing Amazon.com account (who does not have one yet?) and click on the Upload files button to begin uploading your files to the storage. Or, click on the Cloud Drive button to see the files and folders that are already there. Right, all you need is a web browser and an Amazon.com account, and you are good to go. protection and backup of Your Files. This tells us that the files you upload to Cloud Drive are NOT encrypted with a private key that only you have access to: Amazon can have a look into your files if they decide they want to. Keep that in mind, and if a file has a secret you don’t want anyone else to see, do NOT upload it to Cloud Drive, or encrypt the file with strong encryption before uploading it. Take control of your files and folders with AB Commander file manager for Windows 10,8,7,Vista, and XP. Will Amazon Cloud Front create a strong competition to other online backup solutions such as Dropbox, Mozy, or CrashPlan? Not yet. Not until Amazon adds some sort of automatic file synchronization functionality, like these services offer. Still, if you don’t mind handling the backups manually, and have the discipline to do it regularly, Amazon Cloud Drive is certainly a service to consider. Windows 10 fails to upgrade? Here is how to fix it. Windows cannot connect to the printer. Access is denied. How to tell if my Windows is 32- or 64-bit? How do I stop Windows from rearranging my desktop icons? Windows does not offer the NTFS format option? Here is how to bring it back. Slow network in Windows 7 Virtual PC? Speed it up! Why can’t I copy large files over 4GB to my USB flash drive or SD card? Is “Wipe the content” the same as “Secure Delete”? Can USBCrypt encrypt the C: drive?